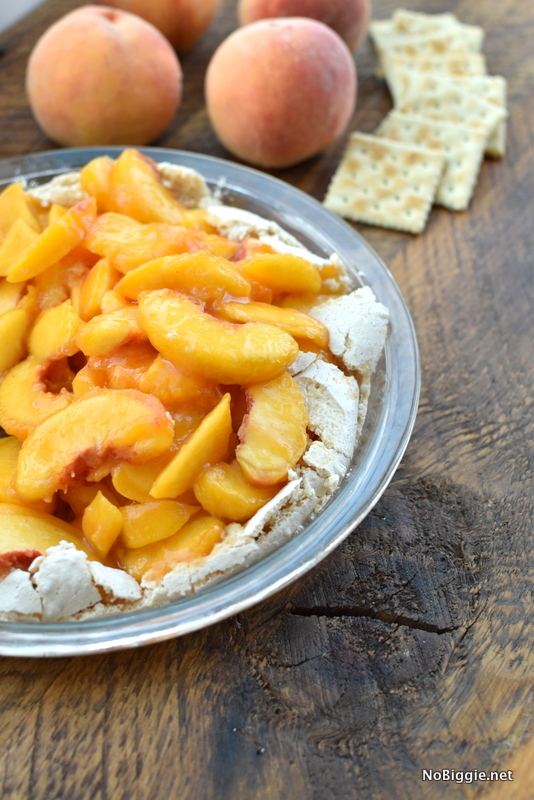 Fresh Peach Pie with a surprise meringue crust made with soda crackers. It’s a salty addition to a heavenly sweet pie. Last Summer our neighbors brought over a fresh peach pie and the crust + fresh peaches together was heavenly! She kindly shared her pie crust recipe with us, and I loved learning that soda crackers were in the crust! Yep…soda crackers. Like the kind of crackers you stock up on when you’re sick. Some call them saltine crackers or soda crackers. The name soda cracker comes from the fact that they are made with baking soda. 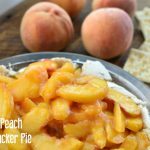 Anyway…the saltiness of the soda crackers along with the sweetness of the crunchy meringue style crust with loads of sliced fresh peaches piled on top makes this the best peach pie! Here’s the thing. This is not one of those perfect slice of pie…pies. It’s more of a “everybody grab a fork”, it’s so good kind of pies. If you’re a germ phobe, and beautiful presentation is important to you, you could try baking the crust in little individual pies for more of a self serving sort of thing. Any way you decide to serve it, you can’t go wrong, because it’s so delicious! 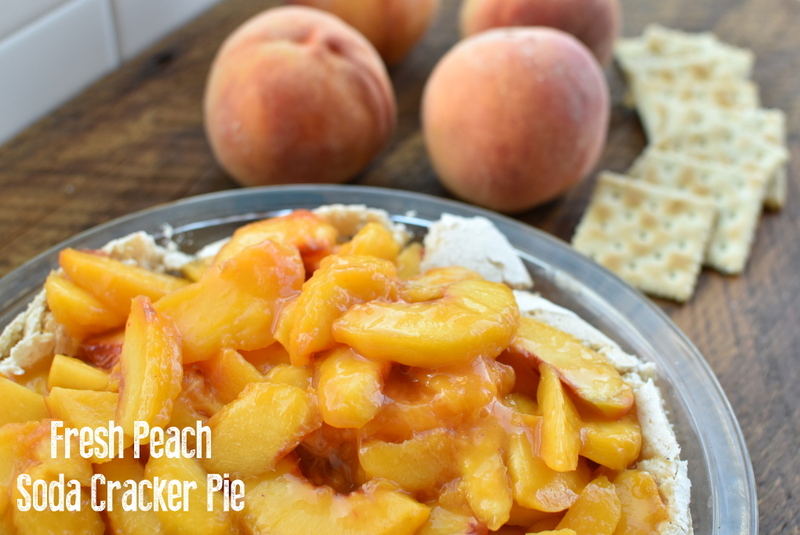 It’s peach season right now, so we are making all the things, and this peach pie will be happening again soon! With a hand mixer (or a stand mixer) whisk the egg whites until frothy. Add in the baking powder and gradually add the sugar, continue whisking until the egg whites are stiff. In a ziplock bag roll the soda crackers until they are a fine crumb. Fold in the soda cracker crumbs into the whipped egg whites. Move mixture into a greased pie dish. Peel and slice the peaches. Move sliced peaches to a colander with a bowl under it to collect excess peach juices. In a small sauce pan set to medium temp, thicken the peach juices with cornstarch and cook until thickened. Toss the peaches with powdered sugar and the thickened peach juice to make a glaze. Add the heavy cream into a chilled bowl and add the sugar and vanilla. Using an electric hand mixer or stand mixer with the whisk attachment, whip the cream to the desired consistency. For soft peaks, the cream will be just thick enough to hold its shape. Whip the cream a little longer for stiff peaks. 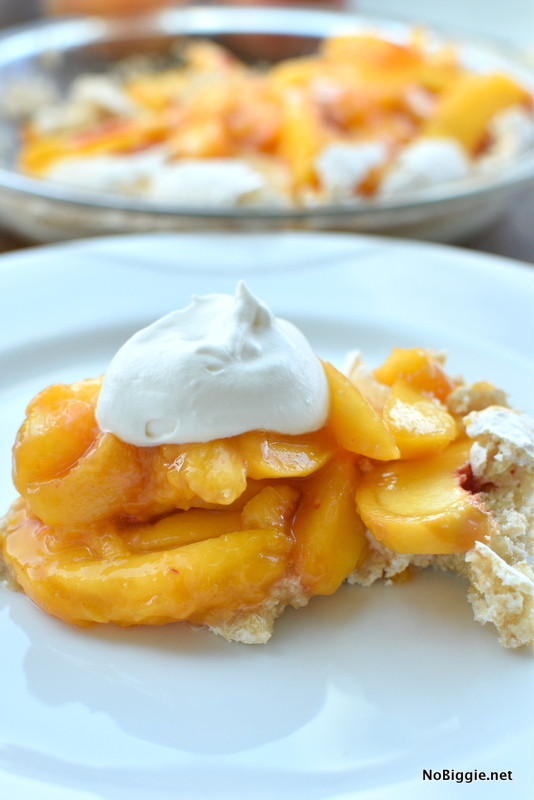 When ready to serve top the pie crust with the fresh peaches and a dollop of whipped cream. Crushed pecans are optional. They can be folded into the egg whites at the same time as the soda cracker crumbs. You can keep the glazed peaches chilled in the fridge, and the pie crust covered at room temp. Add the two together right before serving. Whipped cream can be made up to 1 day ahead, cover with plastic wrap, and refrigerate. If liquid separates from the cream, whip it again to add the liquid back in. We made a quick video so you can see it come together in a quick minute!